Catfish are considered good eating in the southern United States and are often fried. 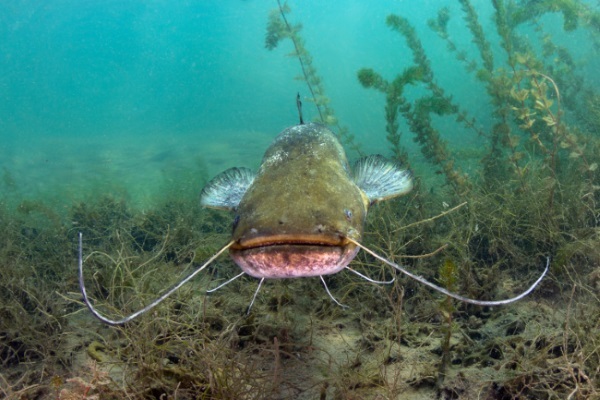 That should not be surprising since they are found in the Big Muddy (Mississippi) least ways, and this continent has quite a few catfish in rivers and such. By the way, watch out for the dorsal and pectoral fins, because many of them are venomous — some dangerously so, which means get treatment. Catfish are found on almost every continent in varying sizes and shapes.Aquarium fanciers can have those that are smaller than the ones served up on a plate just before the sweet potato pie is served, and there are also some monsters in the wild. The Mekong Giant Catfish is huge, but endangered, so don't be eating those because they're endangered. Savvy that? Sometimes people are surprised by new critters, but thousands of species are discovered every year. That means we don't know all there is to know, you know? Places like the Mekong River have more treasures waiting to be discovered, aside from huge catfish. Proponents of fish-to-fool evolution incorrectly refer to speciation and varieties as evidence for their belief system, but that is not the truth. Creationists agree with speciation, and we know that the Master Engineer built adaptability into the biblical kinds referred to back in Genesis. Genetic information is not being added by "selection" or other unseen forces that Darwin's disciples imagine. Those catfish are not turning into cats, so there is no evolution to see here, folks. The variation in size among these is extraordinary—one of the greatest ranges within a single order of bony fish (order Siluriformes). The Mekong Giant dwarfs the diminutive cory catfish (Corydoras spp.) at only 8 cm (3 in) or so—ideal for the home aquarium. Some catfish species reach sexual maturity at just 1 cm (0.4 in). To read the entire short article, click on "Catfish, big and small".